[146 Pages Report] The CFRTP Market was valued at USD 680.0 Million in 2015, and is projected to reach USD 1,690.3 Million by 2026, at a CAGR of 8.66% between 2016 and 2026. CFRTP is widely utilized for varied applications such as aerospace, automotive, and consumer durables, owing to its superior properties, low maintenance, and long product life. 2015 has been considered as the base year for company profiles. In cases, where information was unavailable for the base year, the years prior to it have been considered. Various secondary sources such as company websites, encyclopedias, directories, and databases such as Composite World, Factiva, and American Composites Manufacturers Association have been referred to gain insights on the CFRTP market. Experts from top CFRTP companies have been interviewed to verify and collect critical information and to assess the trends in the CFRTP market during the forecast period. The top-down, bottom-up, and data triangulation approaches have been implemented to calculate the exact values of the overall parent and individual market sizes. The CFRTP market has a diversified ecosystem, including downstream stakeholders such as manufacturers, vendors, end users, and government organizations. Some of the major raw material suppliers are Arkema (France), Mitsubishi Plastics, Inc. (Japan), Formosa Plastics Corporation (Taiwan), SGL Group (Germany), SABIC (Saudi Arabia), Toray Carbon Fibers America, Inc. (U.S.), and Huntsman Corporation (U.S.), among others. The CFRTP value chain includes resin manufacturers such as Arkema (France), Mitsubishi Plastics, Inc. (Japan), and Huntsman Corporation (U.S.); and carbon fiber manufacturers that include SGL Group (Germany) and Toray Carbon Fibers America, Inc. (U.S.). This research report categorizes the CFRTP market on the basis of resin type, product type, application, and region. It forecasts revenue growth and analyzes trends in each of these submarkets till 2026. The CFRTP market is projected to reach USD 1,690.3 Million by 2026, at a CAGR of 8.66% between 2016 and 2026. 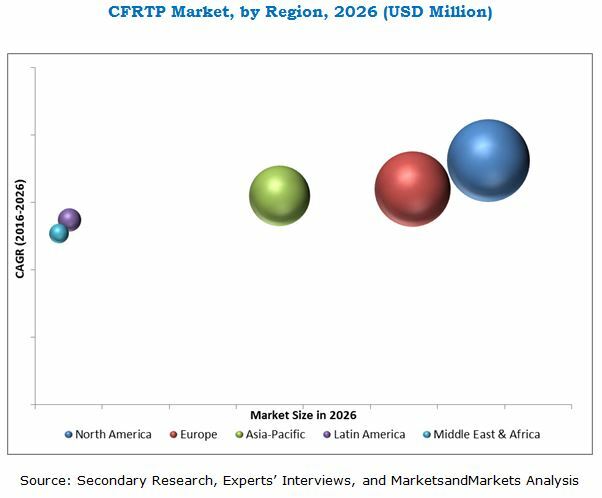 Increasingly applicability of CFRTP in aerospace, automotive, and consumer durables industries, low maintenance requirement, and rapid urbanization as well as economic growth in emerging countries are key factors driving the growth of the CFRTP market. The CFRTP market has been segmented into resin type, product type, application, and region. On the basis of resin type, the CFRTP market has been classified into polyetheretherketone (PEEK), polyamide (PA), polyphenylene sulfide (PPS), and polycarbonate (PC). Among all resin types, the PEEK segment is expected to grow at the highest CAGR during the forecast period, as PEEK resin-based CFRTP offers various properties, including high operational stability at high temperatures and pressure, and high resistance to impact as compared to other resins. On the basis of product type, the CFRTP market has been categorized into continuous carbon fiber, long carbon fiber, and short carbon fiber. The continuous carbon fiber segment accounted for the largest share of the CFRTP market, in 2015, in terms of value and volume, owing to its high strength in comparison to short and long carbon fibers. Major applications of the CFRTP market include aerospace, automotive, and consumer durables. The aerospace application segment accounted for the largest share of the CFRTP market in 2015, in terms of value and volume. CFRTP encompasses various properties including lightweight, easy to construct, dimensional stability, and resistance against chemicals, as well as operational stability at high temperatures in comparison to other conventional materials, such as thermoset composites and metallic alloys. This has contributed to the growing usage of CFRTP in aerospace industries. North America is expected to be the fastest-growing market for CFRTP during the next five years. One of the most significant factors contributing to the growth of CFRTP market in North America is the increasing demand for CFRTP from the aerospace and automotive industries. Aerospace industries such as Airbus S.A. (France) and Boeing (U.S.) utilize CFRTP for producing combat and cargo transport aircraft, owing to its superior properties in comparison to other composite materials. This has contributed to the growth of the CFRTP market in the North American region. However, factors such as high raw material and production costs and stiff competition from thermoset composites are acting as restraints to the growth of the CFRTP market. Solvay S.A. (Belgium), Royal Ten Cate N.V. (Netherlands), Teijin Limited (Japan), Toray Industries, Inc. (Japan), SGL Group (Germany), Celanese Corporation (U.S.), Covestro AG (Germany), PolyOne Corporation (U.S.), PlastiComp, Inc. (U.S.), and Aerosud (South Africa), among others are leading players in the CFRTP market. These companies have adopted various organic and inorganic growth strategies such as agreements, new product launches, acquisitions, and expansions to enhance their presence in the CFRTP market. 11.3.2 Royal Ten Cate N.V.
12.2 Royal Ten Cate N.V.